The most significant variable is the attitude of the management. The more they like it, the more they feature it. To help improve these variables, we have published ways you can increase your income. Therefore, the reports on this page cannot be used to predict income. The following excerpts are from some of the letters and reports we have received about the Spiral Wishing Wells in general locations. 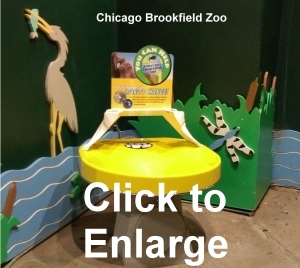 We have a separate page for public installations such as museums, zoos, aquariums, and planetariums. Wells generally pay for themselves very quickly. Even in marginal foot-traffic locations they will return a nice profit. Wells solve a fund-raising challenges for stores. Wells are the best fund-raising device of all time! 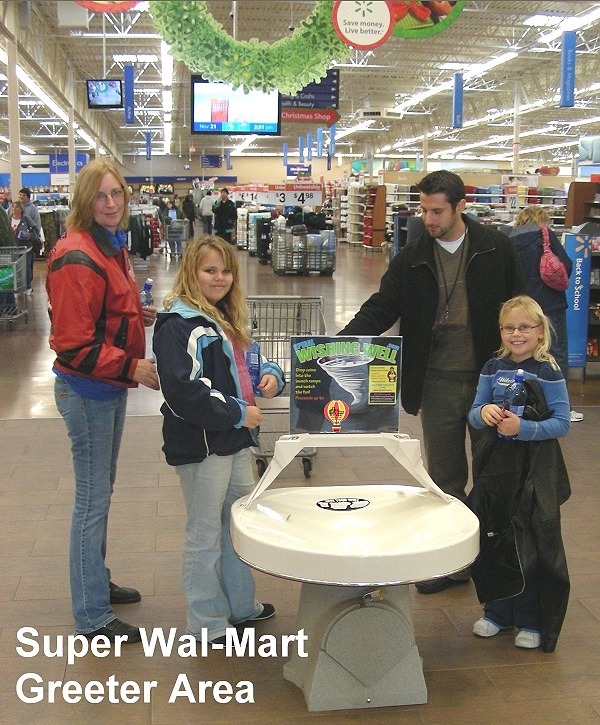 Click here to read Ms. Sengel's report about how Spiral Wishing Wells are performing in 22 Wal-Mart and Sam's stores and why she ordered 10 more. "We placed it at the grocery entrance about two months ago and have consistently collected between $40 and $45 per day ever since. 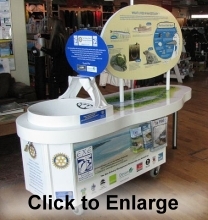 I am so pleased with its fundraising potential that I am ordering an additional unit to be placed at the general merchandise entrance." "We raised $40,979.37 in one day for our building campaign. And the Well is still bringing in about $200 per week. Everyone loves it and it helps us keep a focus on our campaign." Click here to read how they did that. $350 to $1,000 Per Week!!! "It definitely keeps all the members of the family busy, and because the money is going to charity the parents are happy to give! We raise anywhere from $350 in a slow week to $1000 in a busy week! And that's in just one of our locations with a Well. I am always able to stock the change machine from the well without having to go to the bank." Click here to read how they do it. "For the past two years, my company has experienced great success with both your two foot and three foot wishing wells which average about $300 a month. Not only does your company provide these wonderful fund raising tools, but the service is excellent." "We average about $300 per month and have increased the number of children we sponsor each year from 20 to 50." "We purchased our Well in 1990. We have been the #1 contributing Dairy Queen Store in Indiana for twelve (12) years now. This year, our goal is to reach the $10,000 mark, which we are very close to fulfilling. The population of our town is 10,000. Enclosed please find a photo of our manager and some of our employees." "On average we pull about $150 to $200 out of our Well each week." 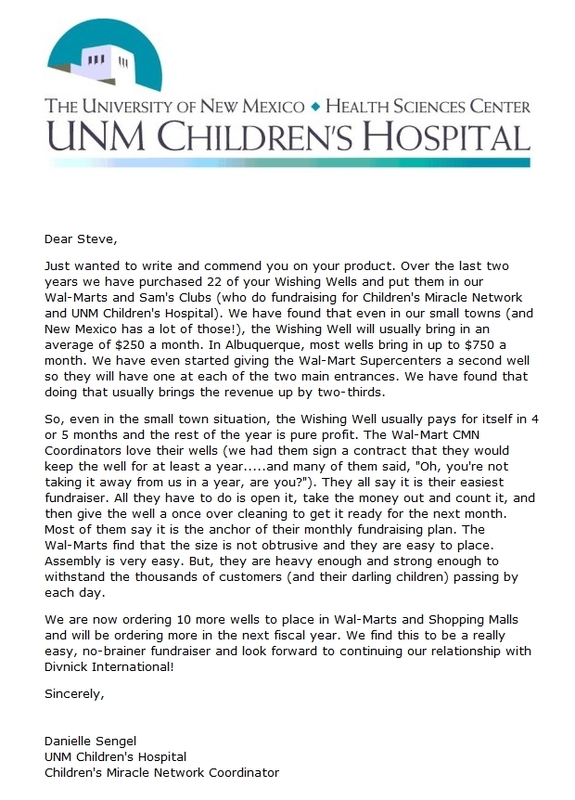 "Just an update on the six Spiral Wishing Wells we're using for the Ronald McDonald Children's Charities. We average close to $900 per month. I would like to take this opportunity to thank you." 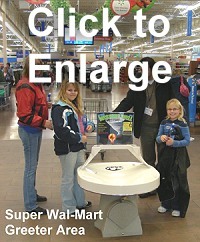 "We have two wishing wells in all 11 of our Wal-Mart Super Centers and Sam's Clubs, one for each entry. They are very effective fundraising tools for us. Our best location raises up to $700 per month with their two wells. They pay for themselves in no time at all. They are entertaining and an easy way to raise funds. It's silly to be without them, they are worth the investment, they last for years." "For the second year in a row, we have used one of your Spiral Wishing Wells in front of our local K-mart. We broke our own one-day record of $532 last year with a one-day total of $864 this year!" Click here to read how they raised so much money in one day! "We first placed our Well in the entrance of our local Wal-Mart store and brought in $125 a month. We then moved it to the exit area where it has jumped to $220 per month.Therefore, it paid for itself in about 6 months and has been all profit for our organization since. Please find enclosed our order for another Three-Footer." "Thank you for contributing to the success of our fund-raising campaigns. Enclosed please find our cheque for 100 Wells. We anticipate other orders will shortly be forth-coming." "One of my K-Mart Wells took in over $2,500 in five weeks." "Thanks for all of your helpful hints. Our first Well has raised nearly $4700 in 24 months and we are really excited to order another one with the enclosed check." "The Well brought in $1200 at the Mall, mostly on Friday, Saturday, and Sunday." "Currently we have 6 wells in our stores which are generating an average income of $5 to $7 a day, or about $180 per month." 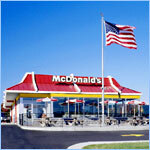 "I have 12 Wells in Arby's Restaurants raising money for Big Brothers/Big Sisters in this area of Florida. Arby's calls me when they open a new store asking for another Well, and Big Brothers/Big Sisters is very pleased with the results." "From June through December, the Toronto Zoo received $21,650 in four Wells." "Our Wells have raised over $250,000 and just keep on bringing it in. 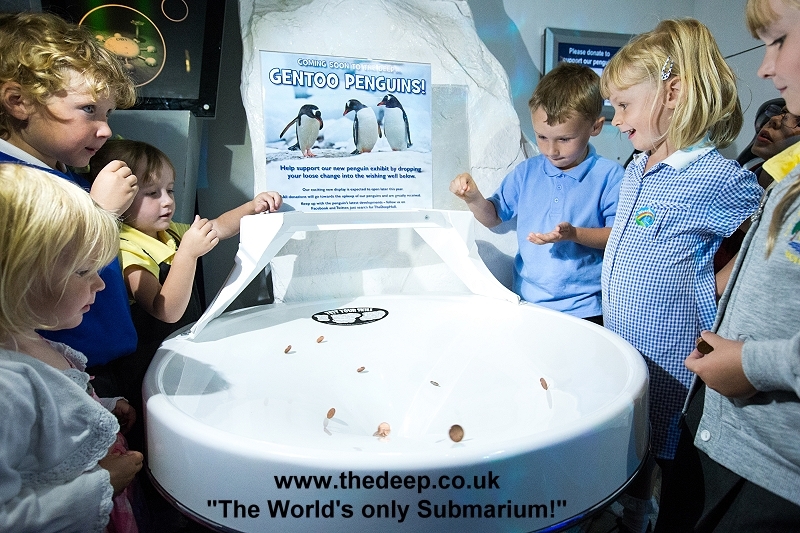 They have far exceeded our expectations." Click here to read more service club reports. 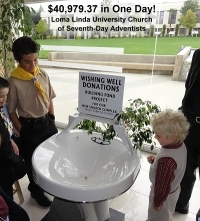 "We had such success with our first wishing well, we purchased additional wishing wells for our other stores. We pick a different organization to fundraise for in the stores and hear such positive feedback from our customers - the kids just love them! It is not only great exposure for the organization but is a reminder to our customers that we are a community minded company." "We have had one of your Wells for 24 years. 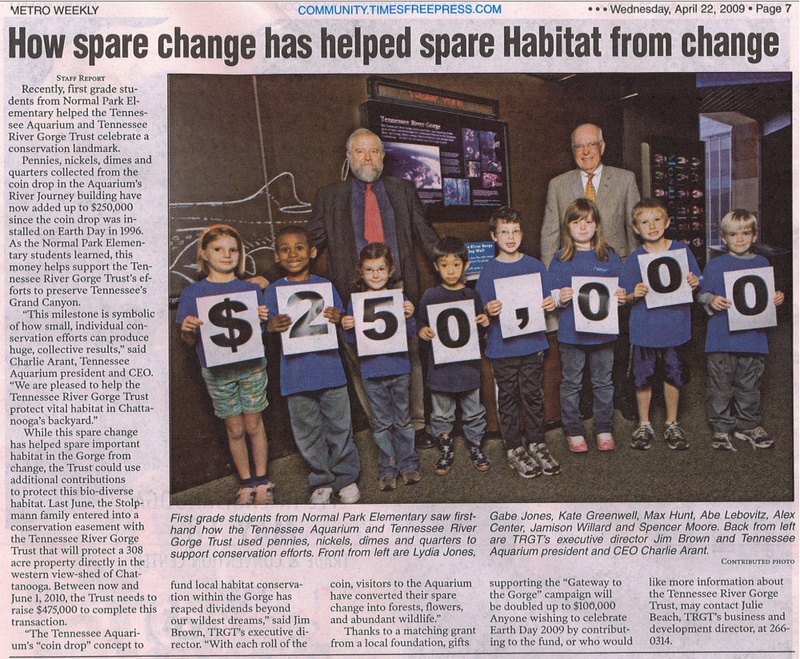 It brings in thousands of dollars each year for various community projects." A family birthday party with a charity focus used a Spiral Wishing Well to raise $591.26 plus $300 worth of groceries for the Food Bank. Click here for more pictures and how they did it. "You will be pleased to hear that our club members are extremely pleased with the income that we are generating through our own wells (having been quite sceptical at the beginning), to date we have banked over £12,000 and we have just added a 6 th Well at one of our local holiday parks. Added to the other Wells we have distributed to other Rotary Clubs, we estimate the total funds raised so far at £60,000." 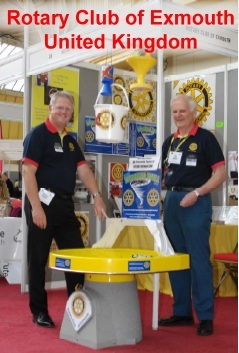 Webmaster Note: As referenced in their testimony, the Exmouth Rotary Club also imports and distributes our Wells to other Rotary Clubs in the UK. They encourage UK Rotary clubs to work in partnership with local organizations wanting to raise funds and get their message in front of their community. 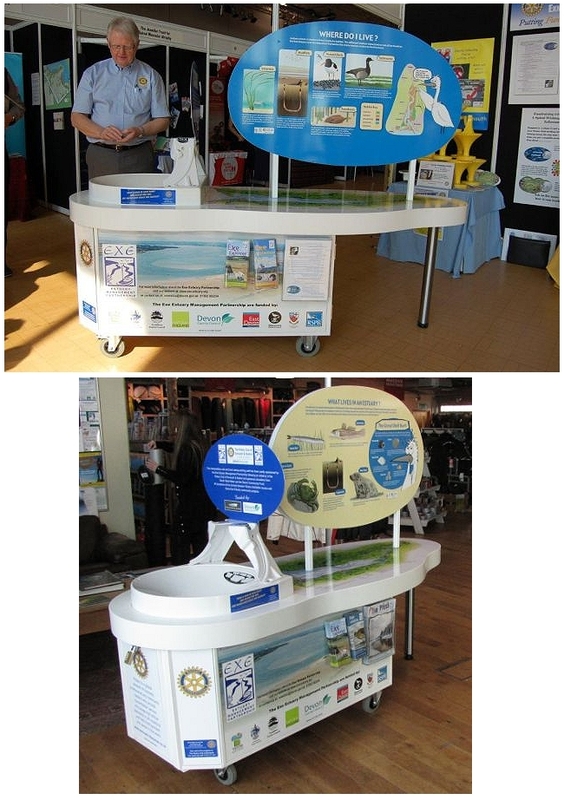 The photograph to the right depicts a custom Two-Footer Well that Exmouth Rotary Club developed with the Exe Estuary Management Partnership which encourages local community groups to get involved in the management of the River Exe estuary. 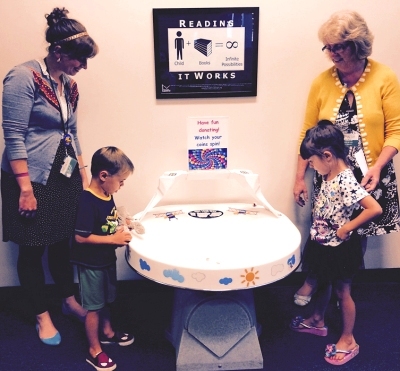 "The Bucks County Free Library has a wishing well in each of our seven branches. We bought three in December 2012. They were so successful that we saved up and got four more the following April. The kids love to drop in coins and watch them spiral downward. It helps parents to have a fun activity to do with their children right before they head home. "Education is our business, so we love that the wells demonstrate basic science principles. Plus, they're way more attractive and compelling than having a plastic pretzel jar on the counter! It's taken a very short time for the wells to pay for themselves. We're working hard on all different kinds of fundraising, which can be extremely complicated and time consuming. The wells are definitely an easy, fun, and profitable way to fundraise." Betsy Hafer, Finance Administrator for the Library System added, "Fund raising is really challenging. Wishing Wells are low-hanging-fruit." Click here for a full list of museums, zoos, aquariums, planetariums, libraries and other public institutions with Spiral Wishing Wells from around the world.